The U.S.-U.A.E. Business Council hosted His Excellency Yousef Al Otaiba, U.A.E. 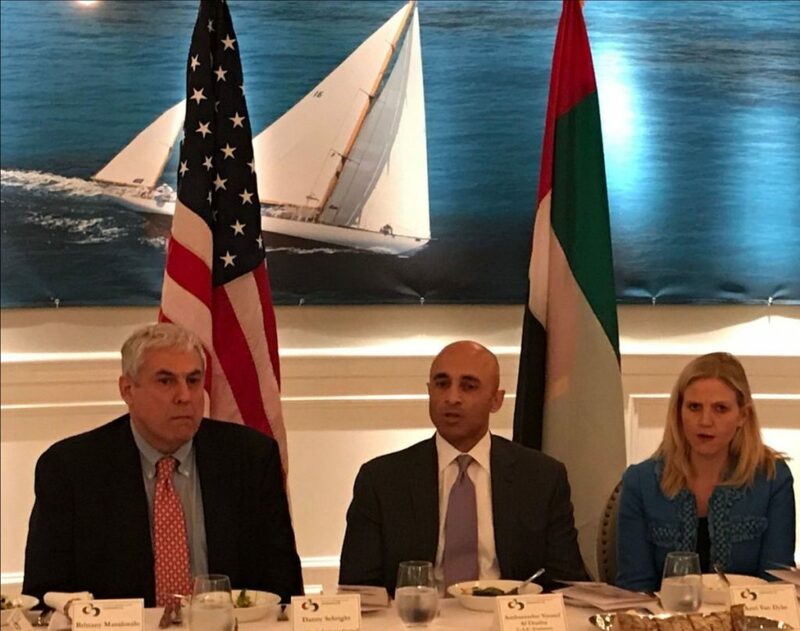 Minister of State and Ambassador of the United Arab Emirates to the United States of America, for a roundtable luncheon and policy discussion with U.S. companies on the 21st of March at Fiola Mare in Washington, D.C. The event was attended by a select group of senior executives from leading American energy, defense, logistics, and technology companies, who gathered to learn more about the U.A.E. Embassy in Washington’s public diplomacy strategy, as well as directly engage Ambassador Al Otaiba on matters of mutual interest to the U.S.-U.A.E. relationship. Attendees were welcomed by Danny Sebright, President of the U.S.-U.A.E. Business Council, who provided brief opening remarks before introducing Ambassador Al Otaiba to the assembled guests. Mr. Sebright emphasized Ambassador Al Otaiba’s support for the U.S.-U.A.E. Business Council in creating opportunities for bilateral trade and investment, and his considerable efforts to enhance bilateral economic and strategic ties. Ambassador Al Otaiba then addressed the group detailing U.A.E. strategic priorities for 2019. He also highlighted recent trade figures from the U.S. Department of Commerce, including the $24.5 billion in total bilateral trade recorded in 2018, making the U.A.E. the U.S.’s largest trade partner in the Middle East and North Africa (MENA) region for the tenth consecutive year. Mr. Sebright closed the program thanking Ambassador Al Otaiba and the distinguished guests for the meaningful discussion, and voicing gratitude for their continued collective efforts to bolster U.S.-U.A.E. relations.